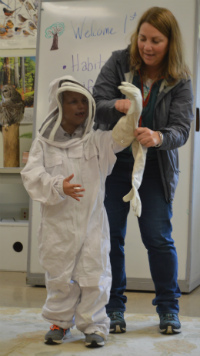 Parker Perdaris took it in stride as his classmates secured various honey bee-body parts to a cardboard cutout he wore to simulate the head, thorax and abdomen. First came the eyes — called compound eyes because they’re actually hundreds of tiny eyes that detect polarized light — then the stinger, plus six legs, two sets of wings, a straw-like tongue called a proboscis used to draw nectar, and basket-like hairs on their legs for collecting pollen. It helps to remember the parts of a honey bee when you can stick them on yourself. That’s what Parker and fellow Bushnell Elementary first-graders learned recently during a trip to the Wittenbach/Wege Environmental Agriscience Center. 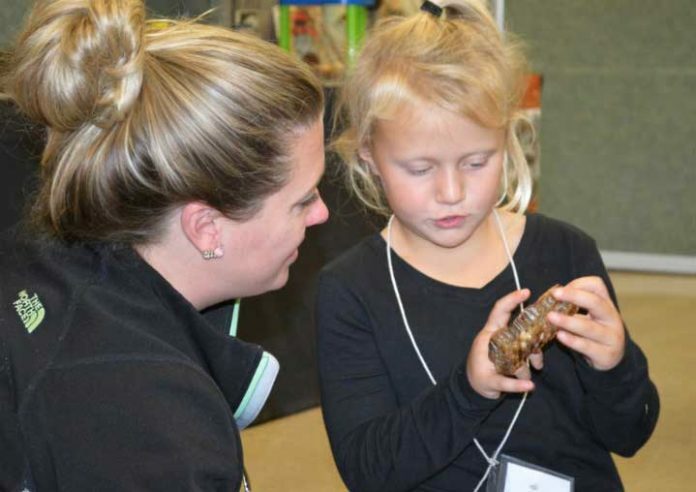 Bee anatomy was just one part of district first-graders’ look at life cycles and habitats. They also visited a meadow, pond and woods on the property to learn about insects, spiders, fish and critters that live under logs. The goal, said center Director Courtney Cheers, is for first-graders to learn about animals native to the area and their life cycles; that they all need food, water, shelter and air to survive; and which animals are found in a given habitat. There are approximately 450 type of bees native to Michigan, and most are solitary, meaning they do not live in hives. 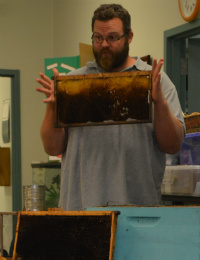 The darker parts of a honeycomb are cells where bees have already cocooned/been born. A hive of agitated bees smells like ripe bananas. Bees do a figure eight-ish “waggle dance” when they want to show hive-mates where food is. Though Parker looked anything but ominous in his bee costume, Bolt and Cheers emphasized to the first-graders how important it is to not appear threatening to the typically non-aggressive insects when you approach their hives. Moving slowly, not swatting at them and wearing light clothing are just a few tips.